Pronounced “me-me and you-ness.” Mimi has pointy ears and Eunice has floppy ears. Above and below each comic on the LEFT is a link to the NEXT strip. Above and below each comic on the RIGHT is a link to the PREVIOUS strip. Mimi & Eunice are written/drawn by Nina Paley, better known for the animated feature film Sita Sings the Blues. For lack of a better option, all Mimi & Eunice cartoons are released under Creative Commons Attribution-Share Alike, also known as copyleft. Click any comic for high resolution (2400 pixels wide) PNG files, suitable for printing. You don’t need to ask my permission to copy or print them, although I’d be happy if you left a link/message in the comments. If you have a budget to pay for works, please send me a donation (see PayPal button on right). You are free to copy, share, sell, remix, modify, fold, bend, staple, and mutilate Mimi & Eunice but you may not prohibit others from doing the same with any resulting copies or “derivative works“. You may include Mimi & Eunice in larger, copy-restricted works (like textbooks, magazines, movies, TV shows, etc.) but the Mimi & Eunice parts must remain under the Share Alike license (aka Copyleft). This is easily achieved by marking the Mimi & Eunice parts “CC-BY-SA Nina Paley” or “copyleft Nina Paley,” even while the rest of your work is under copyright or whatever godawful restrictive license you use. If you make any changes to Mimi & Eunice cartoons, you must take credit for them. Please do not draw “new” Mimi & Eunice cartoons and imply I created them. 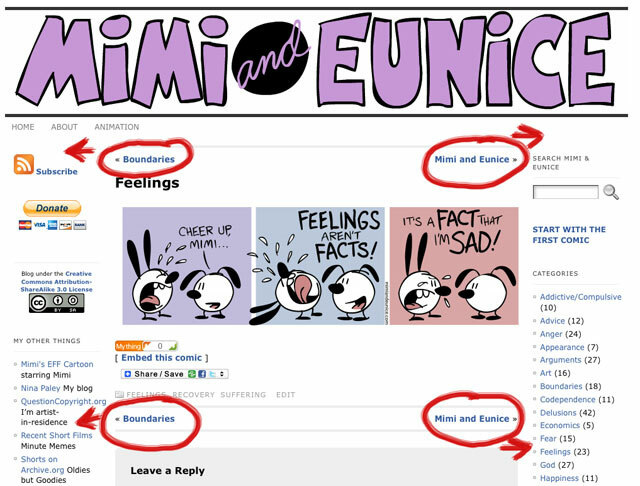 Please do not imply you, or anyone other than me, created existing Mimi & Eunice cartoons. The CC-BY-SA license prohibits fraud and plagiarism, but I really think you know better than to do those things even without the threat of legal force, if for no other reason than self-preservation and not wanting to ruin your credibility and become a laughingstock and pariah. For commercial uses, I request (but do not demand or legally require) you share money with me. Mere use of Mimi & Eunice cartoons does not imply my endorsement or approval. I strongly recommend obtaining my endorsement for any significantly commercial projects, as my endorsement increases the value of commercial copies. My endorsement is negotiated by contract the way “rights” usually are. Please contact me to negotiate my endorsement. Q. Why don’t you sign your name to Mimi & Eunice? A. The “mimiandeunice.com” tag serves as an attribution marker. I make it pretty easy for people to figure out who drew these, if they care. I consider name attribution a gift from the audience, and I’m curious to see whether people choose to include my name when they copy these. It’s up to them. Also I don’t want the art to look too “busy.” Even including the “mimiandeunice.com” tag is an aesthetic compromise. I’d rather the strips remained simple, pure and free. But it’s possible someone will see a Mimi & Eunice cartoon and want to find out more about it, and the tag lets them know, at least until the plug is pulled from the interwebs. Q. I have a great idea for a cartoon. Will you draw it for me?